This week, in anticipation of the Oscars, we’re going through some of our favorite Best Song winners. Halfway through the opening musical number, my wife leaned over to ask a question. 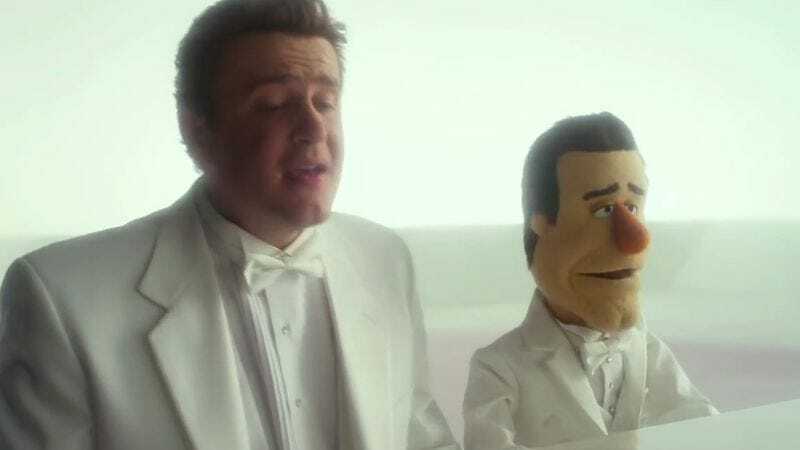 “Did Flight Of The Conchords have anything to do with this movie?” I opened my mouth to answer, but didn’t have to—Amy Adams sang, “It’s never me and him / It’s always me and him… and him,” and there was no longer any question that at least one Conchord had a hand in The Muppets’ production. But “Man Or Muppet” is more than those jokes. It’s the ear-catching restatement of the film’s message about putting childish things aside—while still making time for the things that make us happy at any age. That must be a theme that resonated with McKenzie, who backed away from a third season of Flight Of The Conchords, temporarily eschewing what was his main creative outlet for 12 years to work on projects like The Muppets. It certainly resonated with me in that theater, being a twentysomething married man who’s made appreciating the Muppets on a much deeper level into a major part of his professional career. At some point, we all have to decide whether we’re adult humans or floppy puppet people—and though the responsibilities of growing up are a burden, it beats the constant threat of being eaten and/or exploding. Besides, if you play your cards right, you can make a living out of overthinking those floppy puppet people and/or putting words in their mouths.